Vic West Community Centre *accessibility info to come. This course will introduce the art and science of mushroom cultivation by offering low-tech, home-scale methods for growing mushrooms for food, medicine and earth renewal. We will focus on less-sterile approaches to creating your own mushroom cultures (“spawn”), fruiting mushrooms for food and medicine, and working with fungi to build soil, boost your garden, and address soil and water contamination. Throughout this course, you will learn about setting up cultivation space at home, gathering materials and equipment, and gain experiential hands-on skills to make liquid cultures, petri cultures, grain spawn, sawdust kits, and more. You will learn simple ways to grow and make mushroom medicine, grow mushrooms in your garden, digest household waste with fungi, and work with fungi for remediation. The course will involve a mix of lecture-style learning and a lot of hands-on- both indoor and outdoor skill building. Please join us for the whole weekend, but if you’d prefer, you can join for just one day. Saturday is about starting and maintaining your own mushroom cultures and building low-tech lab skills for culturing wild fungi for medicine and remediation. 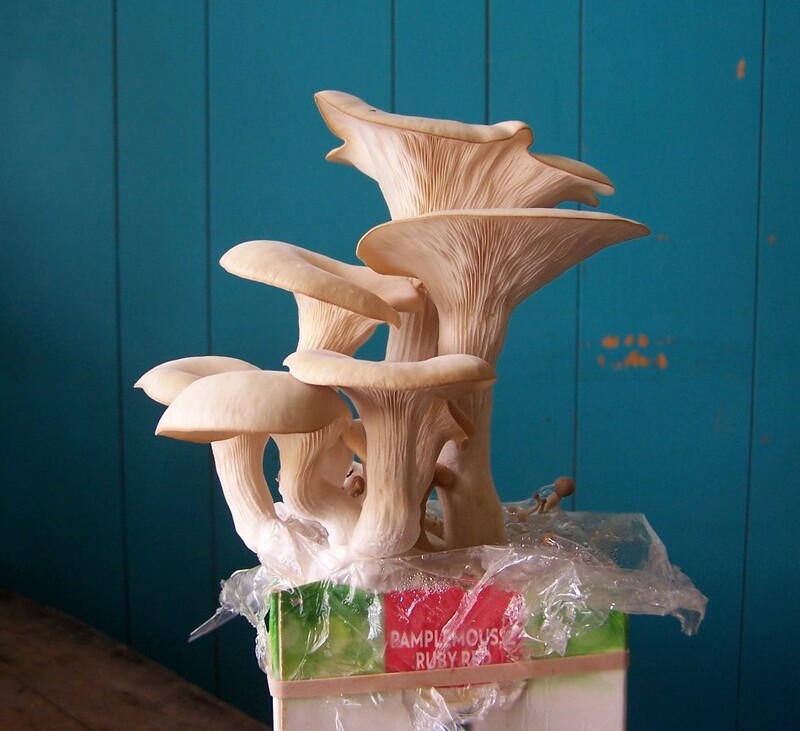 Sunday is a focus on growing mushrooms at home for food and medicine. Each participant will take away their own mushroom cultures (1 liquid culture, 1 Oyster or King Stropharia mushroom grow kit + 1 grain spawn jar) and a Mushroom Cultivation Manual to refer back to. Please join us for the whole weekend, but if you’d prefer, you can join for just one day. Saturday is a focus on growing mushrooms at home for food and medicine, Sunday is about starting and growing your own mushroom cultures. This will introduce the cultivation lifecycle and detail approaches to cultivation (sterile and less-sterile), and then get hands-on in spawn production: we’ll prep the substrates (growing mediums) together- liquid culture, agar, grain, bulk substrates (straw, sawdust, woodchips). 1:15-2pm Equipment + Materials: make a glove box, and go through a mushroom cultivation equipment and materials checklist. 4:15pm: Sawdust kits + next steps: incubating, troubleshooting- what to do if it gets contaminated. *everyone will leave with 1 liquid culture, 1 grain spawn jar, and a detailed mushroom cultivation manual to refer back to. ** if you’d like to build your own glove box after the workshop, please let me know by Thursday and I will purchase the materials needed and support you in building one after the day finishes (5-5:30pm). The materials cost about $100. *this is intended for folks who want to grow mushrooms to eat and/or for medicine at home and/or in their farm or gardens who have little to no experience growing mushrooms. 12:30-1:15pm: Lunch * bring a lunch or go to eat nearby. There are 2 cafes within walking distance (Cornerstone and the Parsonage) and a number of other little restaurants. Cost: $200-300 sliding scale *Please pre-register and purchase tickets here. 1 work trade available. Partial trades available, please contact me if cost is a barrier and you’d like to join.